New criteria divide the disease into three stages. Doctors take a two-pronged approach to diagnosing Alzheimer's disease. First, they ask patients questions and perhaps have them fill out one of the standardized questionnaires used to assess memory and other parts of thinking. The purpose is to evaluate people's cognitive problems to see if what they're experiencing is consistent with Alzheimer's. Forgetfulness coupled with abnormal social behavior, for example, might indicate a different brain disease. And mild problems with short-term memory could be ascribed to normal aging. Second, doctors will order various tests to rule out other conditions that can affect mental functioning. Any CT or MRI brain scans or blood tests that might be done are part of this process of elimination. There is no direct test for Alzheimer's, or for the risk of developing it, in the way that, say, a blood sugar test can be used to assess whether someone has diabetes or prediabetes (a vulnerability to getting diabetes). The guidelines for diagnosing Alzheimer's that were released in April 2011 may eventually change this approach to diagnosing Alzheimer's. The guidelines were written by three groups of academics and industry representatives selected by the National Institute on Aging, which is part of the National Institutes of Health, and the Alzheimer's Association, an advocacy group based in Chicago. They create a new schema for the disease, dividing it into three phases: a "preclinical" stage, when there are no symptoms but changes have occurred in the brain that might result in symptoms later on; a "mild cognitive impairment" stage, when deficits in thinking begin to surface (particularly difficulty with learning and retaining new information) but people are still able to live relatively normal lives; and, finally, dementia caused by Alzheimer's disease. The preclinical phase was developed for research purposes and is not intended to promote screening for Alzheimer's in people without symptoms. Mild cognitive impairment has been the subject of many studies and is a diagnosis that clinicians currently make. The guidelines also put a new emphasis on tests that measure changes in the brain that are, at the very least, associated with Alzheimer's disease and may play a role in causing it. These tests — grouped under the heading "biomarkers" — include positron emission tomography (PET) scans of the brain as well as tests of the cerebrospinal fluid, which surrounds the brain and spine and may contain clues to what is going on in the brain. No one is saying that the tests can be used by themselves to diagnose Alzheimer's. But there's the suggestion in the guidelines that PET scans and other tests could be used to improve predictions about whether someone with mild cognitive impairment is going to develop full-fledged dementia. They might also be used to make the diagnosis of dementia due to Alzheimer's more reliable. For the time being, though, the diagnostic criteria aren't likely to lead to major changes in how most cases of Alzheimer's disease are diagnosed. They may influence how doctors think about Alzheimer's disease to some extent, but major changes in diagnostic procedures, no matter what the disease, often occur only after insurance companies, Medicare, and other payers agree to cover the cost of new scans and lab tests. Moreover, it's not clear at this point whether more elaborate — and expensive — diagnosis would have a meaningful effect on the treatment of Alzheimer's disease. The drugs available to treat Alzheimer's are modestly effective, at best, and don't stop the underlying disease process in the brain. The guidelines make it pretty clear that the PET scans and cerebrospinal fluid tests, which would be a real departure for Alzheimer's diagnosis, aren't ready to be incorporated into everyday medical practice. The tests haven't been standardized. Basic issues, like the cut-off points between normal and abnormal, haven't been settled. 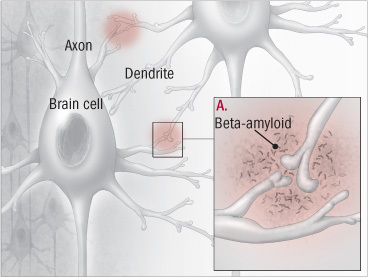 Most experts believe accumulations of a protein called beta-amyloid in the brain are, at least, a marker for Alzheimer's and perhaps a cause (see illustration). Large companies like General Electric and Eli Lilly have invested millions in developing PET scans that detect beta-amyloid in the brain. Other tests have been developed that measure the protein in the cerebrospinal fluid. Yet research has shown that about 30% of people who are "amyloid positive" have no cognitive impairments, so the connection between beta-amyloid and Alzheimer's disease is far from automatic. Other factors may need to be present for the disease to develop. A. Beta-amyloid protein accumulates and disrupts cell-to-cell communication, causes inflammation, and, eventually, may kill off brain cells. Just because diagnosis isn't going to change overnight doesn't mean that these guidelines won't have some effect. It's a safe bet that PET scans and spinal fluid tests are likely to become more common in cases when the diagnosis isn't clear-cut. Some clinicians envision a two-tier system for Alzheimer's diagnosis: one tier for general practice that would not include PET scans and other expensive tests and another for specialized centers that handle difficult or unusual cases that would. Dr. Reisa A. Sperling, director of the Center for Alzheimer's Research and Treatment at Harvard-affiliated Brigham and Women's Hospital in Boston, chaired the group that developed the preclinical part of the guidelines. In an interview, Dr. Sperling said she believes the preclinical criteria are "a key first step toward real prevention trials of Alzheimer's disease." Government authorities wouldn't allow investigators to launch such trials without some criteria for identifying people at risk of developing Alzheimer's as well as biomarkers that can be used to track the effects of experimental drugs, she said. Still, Dr. Sperling estimated that treatment of preclinical Alzheimer's disease would not begin until at least the early 2020s. Dr. Sperling, who is a consultant to several companies developing imaging tests and drug treatments for early Alzheimer's, said a more immediate effect of the guidelines may be an increase in the diagnosis and treatment of mild cognitive impairment: "Alzheimer's disease is a continuum, just like almost every other chronic disease. Mild cognitive impairment should be considered early, symptomatic Alzheimer's disease. We should try to treat people who have it as best we can, and we hope by treating it early, we will affect the course. "Currently, we would offer symptom medications, but at some point, I believe — I hope — we will be able to offer disease-modifying medication and our best shot is going to be to treat the disease earlier."